Weight wise, 100 grams has always been the Holy Grail for a track spike. When Michael Johnson came to Nike, designers did everything possible to shave weight from his spike to make it light enough for his gold medal win, and still his famous Gold Shoe weighed in at 112 grams. That track spike, though, was meant to be worn for no more than 40 seconds by one person for one race. So to say you can make something under 100g was a lofty challenge, particularly when the spike was to be designed for middle-distance and distance runners who need more support and cushioning in their shoes since they compete in them longer. But, this was the challenge that ultimately became the Nike Zoom Victory Spike. Researchers in the Nike Sports Research Lab (NSRL) knew it was possible to get a spike that light. They just needed the right tools to create a track spike that was strong enough to support specific competitive needs like around the corners of a track where runners experience the greatest sheer loads but light enough to get runners around the track faster. Tom Redding and John Truax, the Nike design and development team on the Nike Zoom Victory, weighed everything that went into the spike. They used lightweight Vectran thread. Stronger than Kevlar, it’s spun from liquid crystal polymers and was used to sew the balloons on the Lunar Rover. The Flywire filaments themselves are covered in a TPU film to ensure they don’t snag. The TPU film determines much of the spike’s weight, so it was paired down to only a couple microns thick. Every part of the shoe that could be, was perfected to cut weight. To cut even more weight, the decision was made to remove the sock liner. Instead of using a foam sockliner used in traditional track spikes, a single piece of lightweight suede was used. To get a better fit, the shoe was constructed with a center seam, but then a way was also found to remove the thread itself. The shoe was still sewn up the center, but drafted in a solution more common to surgery water-soluble thread. Now, just before the factory adds the suede sock liner and puts the shoe in the box, the Zoom Victory is wiped down with a wet brush to dissolve the thread. This process removes approximately 1.2 grams. American miler Alan Webb was the first athlete to try the Nike Zoom Victory more than a year ago. He wore it in Brasschaat, Belgium where he broke the American record in the mile with a time of 3 minutes 46.91 seconds. Bernard Lagat saw that winning streak and wanted to try out the Nike Zoom Victory too.He wore the Nike Zoom Victory spike in the World Championships in Osaka where he won the 1500 and 5000 meters. Both of them ran in an all-white version of the spike so that no one could see the Flywire technology. Also in Osaka, just before the 10,000m, Kara Goucher was given a pair of new spikes to try. This spike, called the Nike Zoom Matumbo, was created for distance events and features the same Flywire technology as the Nike Zoom Victory.No one expected her to wear it in the race. But she did that and ran pretty remarkable results. The 10,000m is typically a race against distraction. In the twenty five laps around the track, athletes often find themselves focusing on the smallest thing that’s bothering them. But for once, Kara found she wasn’t distracted by her footwear. It was only at the end that she realized she hadn’t thought once about them and she took bronze. are they good for steeple chase? @Kelly – I assume they would work, but it may just last 3 races! These are some sweet track spikes!!! i own a pair of the victorys and i love them. 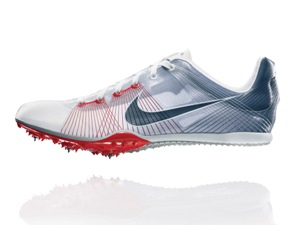 they are by far the best spikes i have ever run in, and i run the 1600m and the 3200m. The names Mario. I have been training with combined 16oz or 1 lb shoes with a 10 pound vest for resistance. After buying the Nike Matumbo’s I ran an 8:40.58 on my first test run for a 1.5 mile. I could have done better but sprinted too early on the back of the race. The shoes are good but still need to train hard with regular shoes and then race day use these 3 oz shoes each adding to 6 oz. Bought these for my son. After 3 races couldn’t remove spikes from one of the shoes. Atlanta Nike Rep said they have styrofoam holding the base the spike screws in to and if that bends it makes it impossible to free the spikes. Lifelong runner and coach and I have never had problems removing spikes. $110 is a lot to spend for spikes that are only good for 3-4 races. @Bridget, my preference has always been Adidas because I find them more durable over Nike, but I am a taller, heavier sprinter at 6′, 190 lbs.